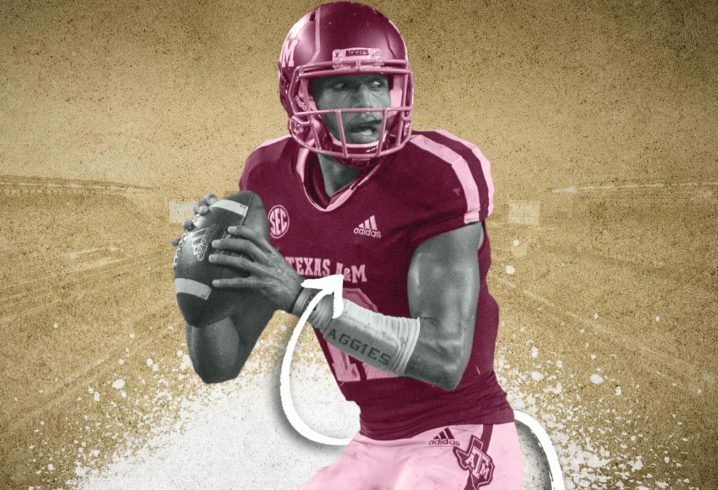 QB Curve: Can Kellen Mond's sophomore leap survive Texas A&M's November fade? In another, more predictable timeline, Mond would have spent his first year at Texas A&M as a bystander, redshirting, and his second as a backup, biding his time behind a bona fide Heisman Trophy candidate before taking the reins in Year 3. In the one we’re actually living, he was tossed straight into the deep end. 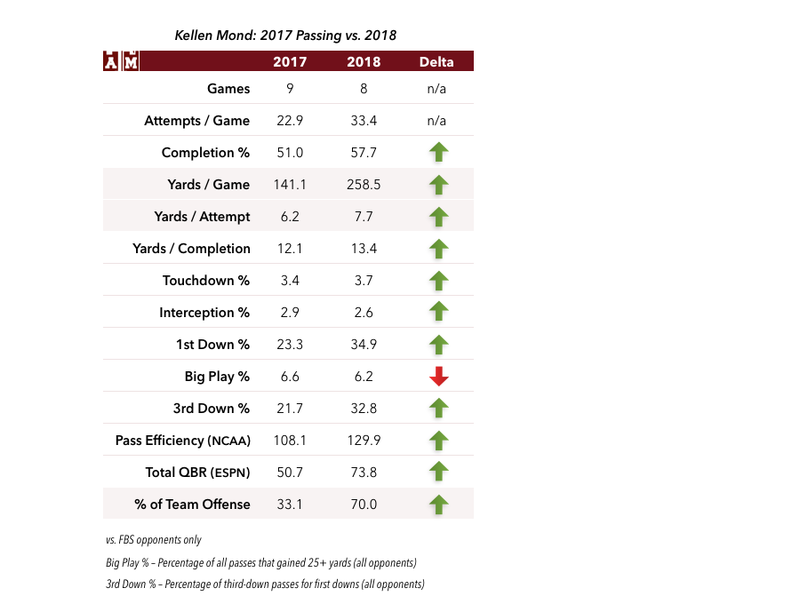 The mass exodus of blue-chip quarterbacks prior to Mond’s arrival left A&M with little choice but to elevate him as a true freshman, with regrettable results: His first game was the Aggies’ historic collapse at UCLA, foreshadowing for a turbulent season that ended with Mond on the bench and his head coach on the chopping block. Through seven games, A&M stood at 5-2 — its only losses coming at the hands of No. 1 Alabama and No. 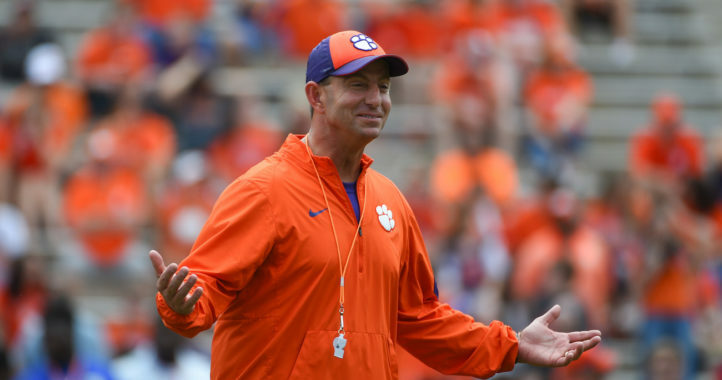 2 Clemson — and ranked 16th in the AP poll, after opening the season unranked. But the midseason momentum also relied on a string of narrow wins over Arkansas (by seven points), Kentucky (by six, in overtime), and South Carolina (by three) in which the Aggies topped out at 26 points. The past two weeks, the pendulum has swung back hard in back-to-back road losses at Mississippi State and Auburn, evoking the annual November fade that defined Kevin Sumlin’s tenure. On paper, the setbacks in Starkville and Auburn coincided with Mond’s worst performances of the season, resurrecting the possibility that he could be benched for fellow sophomore Nick Starkel for the second year in a row. That’s not going to happen this weekend against Ole Miss, which is without a doubt the SEC defense that gives a slumping quarterback the best chance to get right. Once Mond is back on track, though, it remains an open question how long he’ll manage to stay there. If he has any shot at the next level, that game and those handful of plays in particular will have a lot to do with it. Mond’s athleticism and velocity are potentially draftable traits. His accuracy and consistency, eh, not so much. 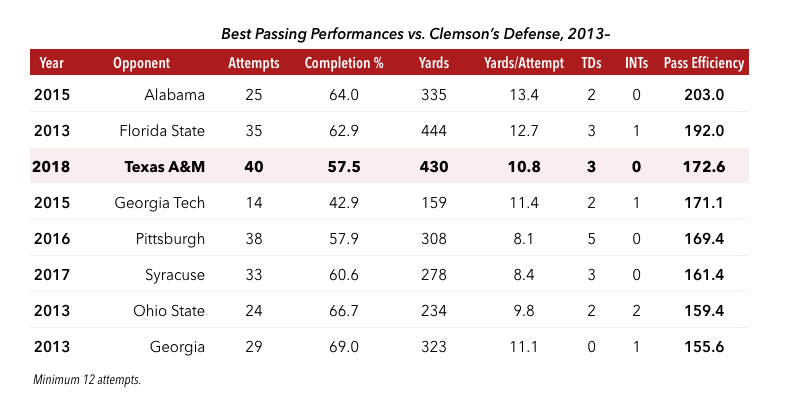 As much as the Clemson game offered a glimpse of Mond’s potential, it also remains an outlier that distorts his overall progress. Much of that progress is relative — compared to last year, there’s nowhere to go but up. Although he has improved dramatically over 2017 (when he finished dead last), Mond still ranks in the bottom half of the conference in completion percentage, and his sophomore touchdown and interception rates have hardly budged. For a guy who’s on the small side for an aspiring NFL quarterback (6-2, 210 pounds, officially), and whose downfield arm strength doesn’t exactly leave opposing secondaries shaking in their cleats (his rate of completions covering 25-plus yards has actually declined), his efficiency still leaves a lot to be desired. To be fair, his receivers haven’t always been at their best, either, especially in the loss at Mississippi State, where the same guys who shared in Mond’s breakout night against Clemson came down with a collective case of the dropsies. Ditto for his offensive line, which has allowed more sacks this season (31) than any other SEC front and ranks 126th nationally in sack rate. But that number is also a reflection on Mond’s grasp of the passing game, and the speed at which he’s making decisions and getting rid of the ball. Mond has improved to the point that he can complete passes on a more or less reliable basis, which wasn’t the case last year. The next step in his growth is eliminating the groaners. In the end, 2018 will be defined by how the Aggies finish it over the next three weeks, especially the season finale at LSU, a team Texas A&M has yet to beat since joining the SEC — the Tigers have won four of the past five in the series by double digits, including lopsided blowouts the past two years that hastened Sumlin’s exit. This weekend’s date with Ole Miss is an opportunity to look good against a bad defense in a nationally televised game on CBS; the LSU game is an opportunity to sell Fisher’s debut season as a success. For Mond, just settling in for the long haul in a position that’s been a revolving door should count for something. He’s already the Aggies’ longest-tenured starter since Johnny Manziel; if his progress continues at the same rate in Year 3, the turnover that forced them to accept the initial growing pains will be largely forgotten. But Mond has to get there first, and if the current mood in College Station persists there’s still a chance he might end Year 2 right back where he started. Ranking the league’s starting quarterbacks heading into Week 11. 1. Tua Tagovailoa, Alabama. 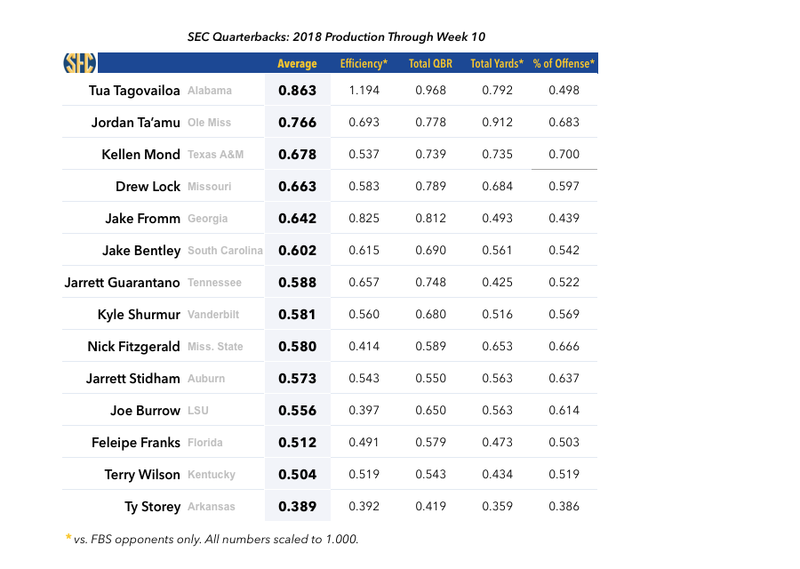 Tua looked almost mortal at LSU, throwing his first interception of the year and finishing with season lows in terms of yards per attempt (7.0) and overall efficiency (129.5); with that, he also ceded the national lead in efficiency rating for the first time all season to Kyler Murray. But his most telling number was 42: That’s how many times Tagovailoa put the ball in the air against the Tigers, including a personal-high 31 passes in the first half alone. 5. Kellen Mond, Texas A&M. Jarrett Stidham makes a perfect throw. 13. Feleipe Franks, Florida. The tide has turned almost overnight on Franks, who seemed to be on the right track at midseason and now finds himself fighting (again) to remain at the top of the depth chart. He was benched in Saturday’s 38-17 flop against Missouri, yielding to backup Kyle Trask after starting 9-of-22 for 84 yards. Trask fared better (10-of-18 for 126 yards, 1 TD, 0 INTs), but not so well that Dan Mullen was willing to anoint him the starter this weekend against South Carolina. Matt Hinton is a college football writer who has previously written for Dr. Saturday, CBS and Grantland. Follow Matt on Twitter @MattRHinton. Pretty fair analysis regarding Mond. Jimbo’s system is complicated and it seems Mond hasn’t quite got it down. Hesitates at bad moments. 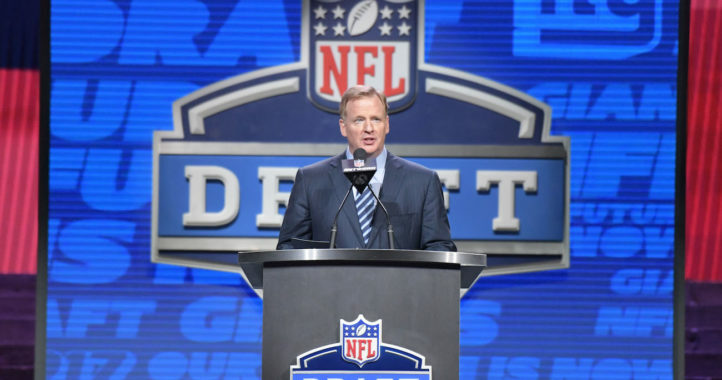 Hesitation, a porous O-Line and WR drops and not creating seperation. That’s a lot to overcome against good SEC defenses. Jimbo is “1000%” behind him so I have to trust Mond still is the best choice for now and the near future. Not gonna lie, I keep forgetting Jordan Ta’amu even exists. I think A&M has more upside than any team in the SEC, or at least the West. Texas is a hotbed for talent and Jimbo has a stranglehold on the state currently. I expect a top 3 finish in recruiting this year. Given Jimbo’s resume and the talent coming in for the coming years, A&M will be a problem in the West. I expect Aggie recruiting ranking this year anywhere from #3 to #7. Class is about full (24) so 2 to 4 teams may pass us up down the stretch. Good news is Jimbo does that well on a regular basis where last four classes averaged around #15. I don’t expect much next season with Clemson OOC and UGA cross-division game, but no reason not to be competing regularly for a chance for the division/conference relatively soon on a regular basis. If looking “mortal” means Tua, on a suspect knee, has the best QB stats of any other QB that’s played LSU, which ranks 8th in passing defense efficiency, I’ll take it. If looking “mortal” means two passing TD, one rushing TD, and only one INT against LSU, which ranks 1st in the nation in INTs, again, I’ll take it. Murray can rack up all the stats he wants against the porous defenses of the Big 12. I’ll take Tua only looking “mortal” against a defense with NFL talent littered throughout.